Over Christmas while I was home in the States, I got to spend time with Marseille and aside from eating and non-stop talking, there was lots of yarn and FO petting. Her finished objects are so lovely I really wanted to profile a few of her creations here because if they inspire me (as they do), they may inspire you too. And I know how curious I always am when I see a beautiful FO and wonder what it was like to knit. You know, where were the challenging parts of the pattern or the boring bits, how did the yarn suit the design, and so on. 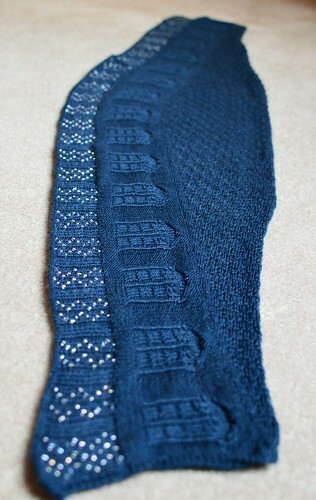 I’ll try profiling more friends’ FOs like I did with Aine’s shawl and this post. 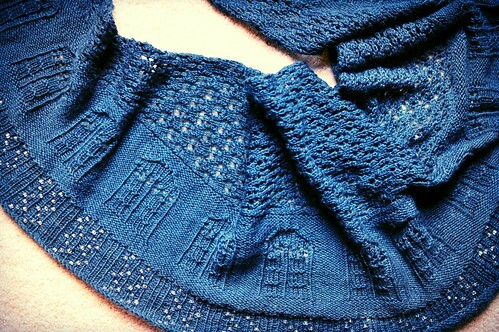 Marseille knit Bigger on the inside (aka the TARDIS Shawl) by Kate Atherley from Knitty, Spring + Summer 2012. It is a free pattern with over 1,700 projects on Ravelry. Marseille used two skeins of Lorna’s Laces Solemate in the Bigger on the Inside colorway, which she bought from The Loopy Ewe. Usually, she is an efficient project knitter, but this one took three years from start to finish! 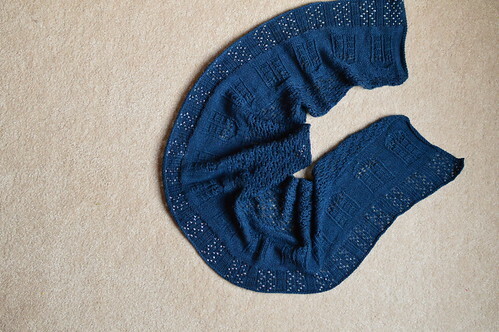 Which had me curious as to the cause of the delay in her knitting the Bigger on the Inside TARDIS Shawl, so I’m profiling her experience here. Marseille cast on in May 2012. She hoped to finish by the beginning of July, but in spite of great progress the deadline had her stymied. She decided not to finish it for the event and that relief let her enjoy knitting it again. It wasn’t until October or November that she got back on track with the shawl. 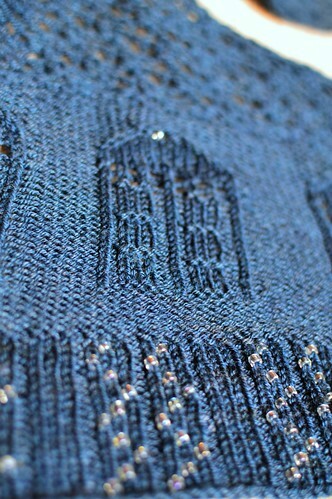 The TARDIS shawl elements were straightforward enough and having different textures kept it interesting. By the end of the year, she was down to just the ribbing at the end. Marseille took her time to determine how to incorporate beads into the 3-by-1 ribbing. She gave herself a few months to figure it out then in February she finally tackled the ribbing. 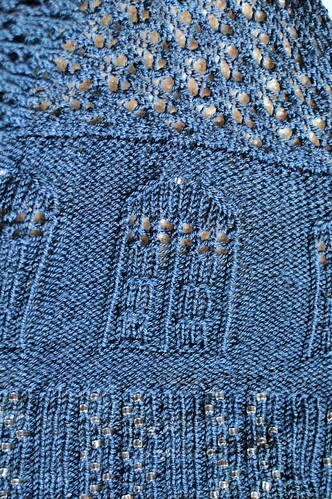 Using a zigzag design, she incorporated the beads on select knit ribs. Had she put beads on all of the ribbing, it would have just been too much beading. When done, she cast off with a size 8US (5mm) needle to make sure it wasn’t tight. Then the shawl waited and waited for about 15 months before it was blocked. That seems like a ridiculous length of time until you see the shawl in person because it is long and would take up a lot of floor or dining table space while blocking. But the AA County Fair in Summer 2015 was incentive enough so she made it happen and, sure enough, her Bigger on the Inside Shawl won the Red Ribbon! 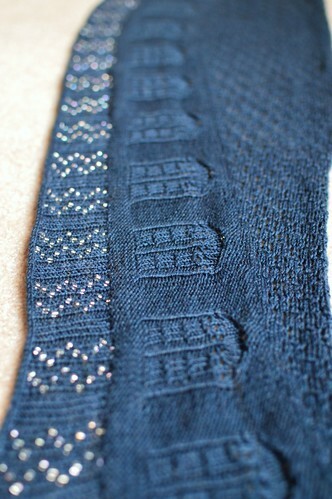 Marseille does love the result and is glad she knit and especially pleased with how the beaded ribbing turned out. 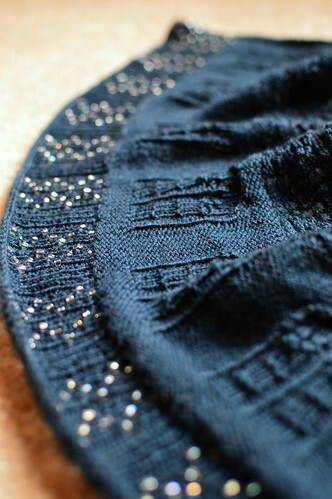 Here are some more photos of the shawl in all its glory. Check back again to see what FO I profile next. 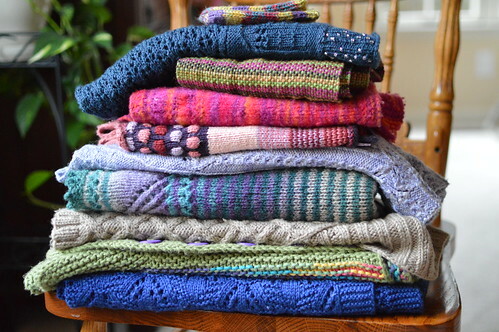 Here’s a peek at a delicious bundle of Marseille’s knitted projects she let me photograph last month. Have you knit Bigger on the Inside? What did you think? Do you really want to knit your own TARDIS Shawl? This entry was posted in Knit Shawls & Wraps, Knitting | Crochet and tagged free knitting pattern, free knitting patterns, Marseille.